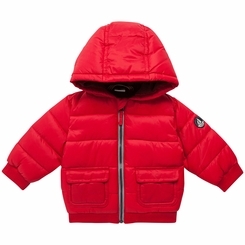 Made in nylon, this baby padded jacket is specially designed for babies, with an appropriate volume and cut. You'll love the little patch badge on one sleeve and the tone-on-tone polar fleece lining that makes for a very warm jacket. Ideal for everyday wear, it's a sure bet for winter.